Let the overcamping of the Headless Horseman begin! Because, apparently, we are people of very little ambition, my guild spent an hour of our pre-work/school time running the Headless Horseman script in the graveyard wing of the Scarlet Monastery. Here’s the Pumpkin Shrine where you run the script — level 70s can easily bypass all the trash, except the lone patroller on the way. 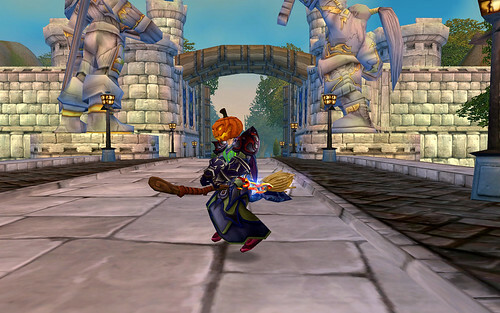 Here’s a lucky fellow in Stormwind who scored the epic version of the flying broom, Swift Flying Broom. The tooltip is in error, by the way, you can use your broom many times for the next two weeks. We four-manned the encounter with a holy paladin tanking — was a mild challenge because of the impaired tankage (plus, our warlock is … let’s say, not so bright). Later, another soon-to-be-late-for-work guildmate (mage) logged on and the 5-man party was E Z mode. The rings and crappier brooms drop ALOT — the real prizes are the pet squashling and the epic broom, of course. Details on the encounter and the loot table is on WoWWiki. 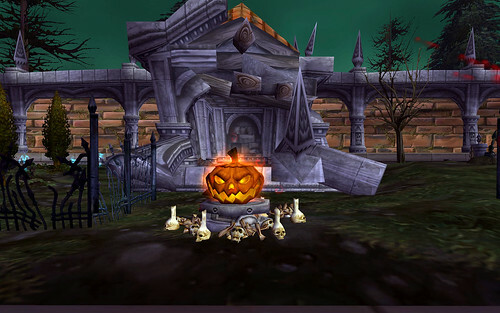 Nethaera, Blizzard poster, announced the “Leveling Improvements for Patch 2.3” today on the World of Warcraft forums. The first notable change was to simply reduce the amount of experience needed each level by approximately 15% between levels 20 and 60. Please note that when the patch is released, characters affected by this change will remain at their current level percentage. We’ve also added approximately 60 new quests in Dustwallow Marsh. This should help players who find themselves lacking quests in the 30-40 range. The Steamwheedle Cartel is building the new town of Mudsprocket in south-west Dustwallow Marsh, so you’ll have to wait until construction is complete to learn more about these changes. The level range for most every dungeon is being adjusted so that there is a much smaller range between the level of mobs found early in the dungeon to those found towards the end. … we’re also upgrading all pre-bc dungeon boss drops to blue quality items. Faster leveling and more experience is good. Not as easy as buying a character or inheriting one from a retiring player, but there’s something to be said for playing it straight.